The original ROKU RCGR4 RF Game/Voice/headphone Remote Control is in-stock and ships within 24 hours. 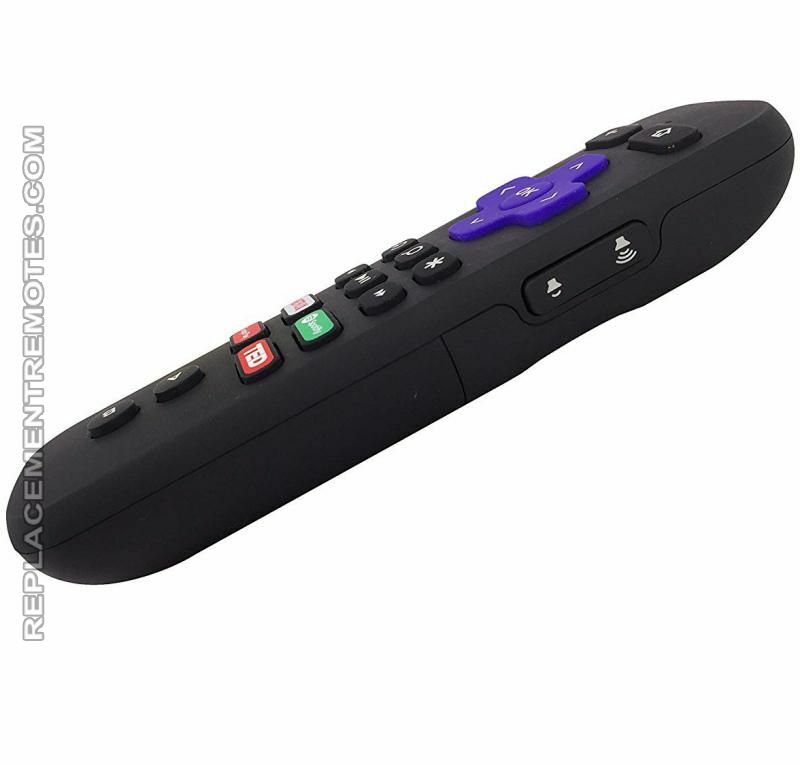 The original ROKU RCGR4 RF Game/Voice/headphone Remote Control carries a 60-Days Warranty. Will replace most other RF roku remotes and Game remotes. Just sync/pair it with your unit. Pairing instructions below! Fully loaded with Maximum entertainment. Use your voice for searching across all entertainment platforms. Plus has a headphone jack with volume buttons for private listening. It has the lost remote finder for compatible Roku players. This remote has the Gaming Functions. - Headphone jack for listening with headphones. - Doesn't have TV power/volume buttons. Volume keys that are located on the remote are used for the headphones. - Will not do IR. • Hold or place the remote close to your device. The Roku TV or player will detect the remote and execute pairing automatically. • Disconnect your Roku device from power and reconnect it after about 5 seconds. • When the home menu appears on your TV screen, insert the batteries into your remote, but leave the battery compartment open. • Locate the pairing button in the battery compartment of the remote. • Press and hold the pairing button for 3 seconds or until you see the pairing light on the remote begin to flash. If the indicator light does not flash, try again. If the light still doesn't flash, try a different set of batteries. • Wait 30 seconds while the Roku device executes the remote pairing process. You should see a message on your TV stating the pairing has been completed. The new remote did not work for me, so I returned it. Will probably order the new connector for ROKU. by Elizabeth on July 20, 2018. So far it's working as expected. The power button would be a nice feature for these types of remotes. by Michael on January 31, 2019. Exactly as described & pictured. Very happy with quality AND price - excellent value. by Megan on January 05, 2019. Great remote control really works perfectly. I recommend it 100% . really match like picture in Internet. by jorge on December 12, 2018.
by samuel on September 25, 2018. Works fine but battery cover won't stay on. It's defective. by Lillian on August 17, 2018.
by henry on August 07, 2018.
by Ricky on April 18, 2019.
by Patrick on March 11, 2019. Great item for a great price! by Clarence on March 04, 2019.
by Jimmy on February 28, 2019.
by Neal on February 28, 2019. Perfect, exactly what I needed and has all of the functions I hoped for. Only wish it was a little cheaper. Pretty outrageous price for a remote. by Jeff on February 28, 2019. So far we have had no problems with the replacement remote we purchased from Dan's Electronics. Hopefully it will last longer than the original remote, we purchased through Best Buy. by Sandra on February 18, 2019.
by Fredis on February 06, 2019. It works just fine. It would be nice if you could choose your own 4 channel buttons on the bottom but you can't. by Bert on January 30, 2019.
by Rex on January 29, 2019.
by Mitchell on January 18, 2019. Works GREAT. Good source for a ROKU remote that works like original and at a reasonable price. We bought this one as a second controller so my wife & I could work the remote without throwing it back & forth to the other person. Would buy from them again if I needed another control. by Jack on January 15, 2019. Worked perfectly. Headphone jack has great audio and it synced on the first try. Thanks! by Derek on December 30, 2018.
by ALEXIS on October 30, 2018.
by Judy on September 09, 2018. The item worked perfectly and the service could not have been better. Very favorably impressed by this vendor. by William on August 12, 2018. Perfect replacement. Service was very fast. Do wish quick access app buttons were different but that's not ReplacementRemotes.com(s) fault. Thanks ! I'll be sure to recommend you. by Alyn on August 11, 2018.
by Thomas on July 19, 2018.
by Michael on January 23, 2019. Should have been shipped in a box instead of a padded envelope. Otherwise ok.
by RHETT on January 06, 2019. Needed the headphone jack. Original remote failing. Great Christmas gift! by Frank on December 31, 2018. Works fine like the original. by Eddy on October 29, 2018. I received the remote in good working order and condition. My only issue is that the remote does not has the power button on it. I got the replacement because the headphone jack was worn out on the original. This was a misunderstanding on my part regarding the model of the remote, I was not aware that there were different versions. by Herbert on October 14, 2018. Great Roku RF remote to control everything except TV power and volume. No infra-red means line of sight view to Roku base isn't needed. It will pair with Roku Ultra. Very convenient. by Roy on October 06, 2018. It works, that is what it is supposed to do. The only problem I have with it is the buttons are not the same as the original, so I wind up hitting the wrong buttons, as I am used to the original layout. 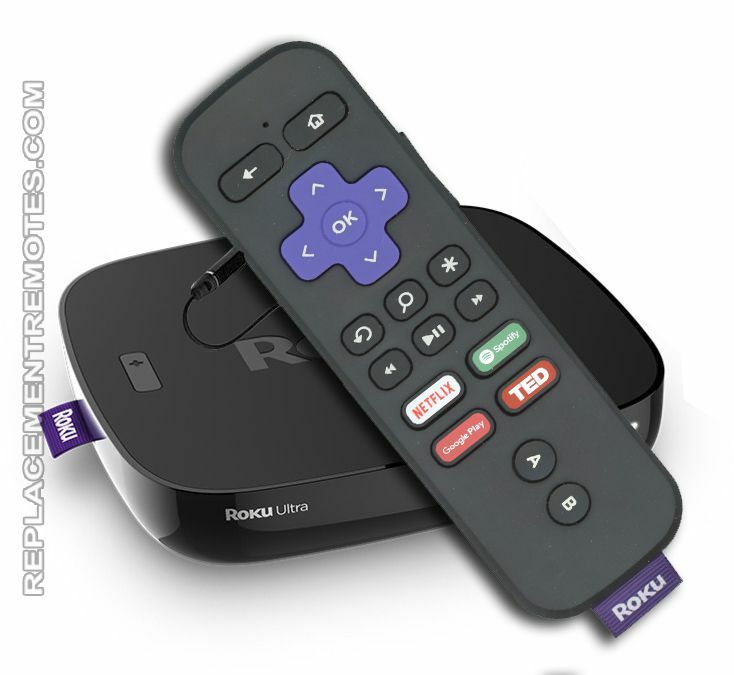 As for ROKU: The pre-program buttons should be programmable by the user. I use only ONE of the buttons as programmed by Roku. None of the buttons are the same as what are on my original remote. 3 of the four buttons are not even video channels. 2 are radio and one a download site for Android phone apps. If they have to be programmed by Roku, why not more popular channels, like Hulu, and Amazon Prime, PBS, and CW. Channels people actually use! by Doug on September 20, 2018.
by scott on December 17, 2018. Received very quickly aand exact product ordered. by carlene on November 15, 2018. Great quality, works perfectly. Replaced our original remote. by Regina on August 06, 2018.